We were on holiday down in Cornwall recently, so like lots of other families we went on a day trip to the Eden Project. We'd been there for hours, and had tired legs, when we popped into the exhibition building known as The Core. Inside, there's a huge wall made of old fridge-freezers, and thousands of black magnetic letters you can use to compose a message on their doors. What a brilliant idea. Even more brilliant is that on the floor beneath the fridge-freezers, there's a wooden trough that catches the letters that fall, or get knocked or dropped off. And on the front of the wooden trough are these words: "Please don't stand on this wooden bit. Thanks." They could have written anything on those wooden troughs. They could have just put: "NO STANDING", which would sound aggressive. They could have put "Don't stand here", but that would have been unclear - don't stand where? On the wooden bit? In front of it? People wouldn't know. The words they did use were exactly the words a normal person would use to tell their kids (it's mostly kids) not to stand on the wooden bit. 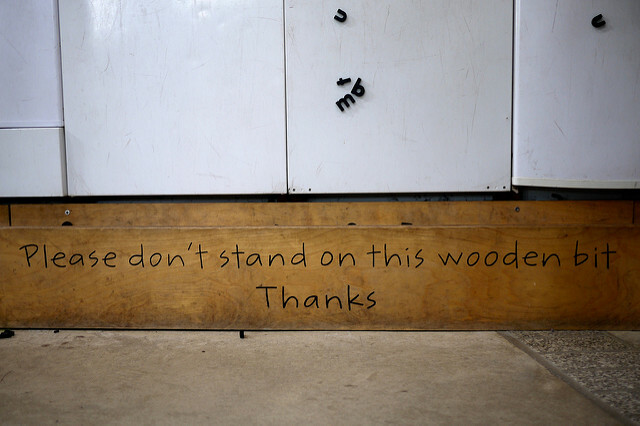 "Please don't stand on this wooden bit." It's simple, it's clear, and it's something anyone can understand. Maybe they iterated their way to this. Maybe there were previous, unsuccessful, more aggressive, less clear versions. What's there now works just great, and people (including the kids) don't stand on the wooden bit. This is the bit where I finally make a point. A lot of my work in the last couple of years has been re-writing other people's words and turning them into blog posts. Most of the time, the process is the same: I sit down and talk to the original author and get them to tell me the story. What's going on here? I ask them. What does this post need to say to its readers? We have a chat, I ask some questions, then I go away and re-write. Sometimes I don't change much, other times I do. At the end there's a draft, which I show to the author again. "Here's a draft," I say. "What do you make of it?" And often, they say: "That's great! I wish I could have written it that clearly." The thing is, they did say it clearly when we sat down for our chat. They spoke to me like normal people speak, using the words that normal people use. After all, in that moment we were both two normal people trying to communicate an idea, to get it from one person's brain and into another's. Those normal words are the best way to do that. Afterwards, I just remembered the words and phrases the author said, and put them into the blog post. When you're struggling to write something that sounds clear and sounds human (two of the essential basics of a good blog post, I'd argue), just use the words normal people would use. The best way to find out what those words are is to try talking the thing through to someone who doesn't know anything about it. Remember what you just said, then write that.